When your child was a baby, you were probably really grateful the way the pacifier soothed your little one. Now that she's older, she should be able to self-soothe, day or night, without the help of a pacifier (or thumb for that matter). Convincing her of that can be tricky, but there are some great methods you can try to employ to say goodbye to the pacifier for good. One caveat—no matter which method you employ while pacifier weaning, make sure you remove all of the pacifiers in the house once you think you are finished. Some children are known for keeping a stash of binkies hidden throughout their home and stumble upon them throughout the course of the day or week. You don't want to have your child give up the pacifier only to have your progress set back because she found an "old friend!" Cold turkey. This isn't the method for everyone, but many parents feel simply taking the pacifier away and not returning it is the quickest, cleanest way to go. Yes, there will be tears and possibly some temper tantrums, but in the end, once the pacifier is gone, it's gone and that's it. Now you still need to explain to your child what is going to happen (and maybe give them some fair warning), but the most important part of this method is to stand your ground and not give in. Phase it out. Start to set limits on when the pacifier can be used. Not in the car, not in the living room, not after a certain time, etc. Eventually, the hope is that she'll realize she doesn't need it anymore. Make the pacifier disappear. Enlist your preschooler in getting the pacifiers out of the house, either by putting them in the garbage, sending them away up into space via balloon or mailing them to "babies who need them." 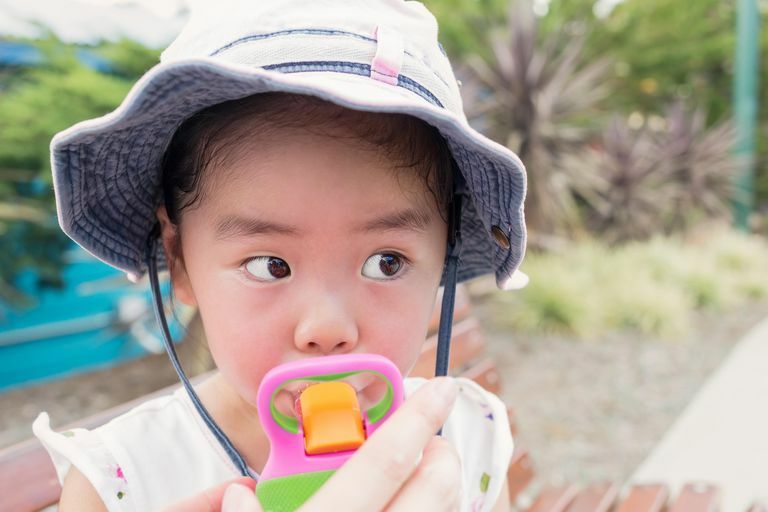 This will also require a talk about no longer using the binky, but by getting your preschooler to take an active role in the process, she may be more likely to stick with it. Let it stay lost (and don't buy any others). If your child loses her pacifier, don't tear the house apart looking for it. Or, look but don't look too closely. If your child asks where it is, explain that you can't find it. Let your preschooler decide. Eventually, believe it or not, your child will let the pacifier go on her own. (Know many tweens that use them?) Remember too, if you force your child to give up the pacifier and she isn't ready, she could possibly transfer her affection to something else—a lovely, her thumb, biting her nails, etc. If she's really struggling to let the pacifier go and it isn't interfering with her development, give it a rest and try again in a month or so.